Scroll down to see this month’s bookmark! Lesson summary: The glory for all we do belongs to God. 1. Daniel interprets Nebuchadnezzar’s second dream. Daniel told the king to obey God’s commands—to stop sinning and practice righteousness. But even if the king wanted to stop sinning, he would not be able to. And if he could stop sinning, he would still be guilty of all the bad things he had already done and would still need to be punished for his sin. What the king really needed was to give up and call out to God for mercy. We are all sinners. We continue to sin no matter how hard we try not to. Plus, all the good things we do cannot cover up the bad things we have already done. Our only hope is to call out to God to save us. God has provided a way for us to be forgiven by sending his Son Jesus to die on the cross for our sins. It is only when we trust in the good work of Jesus on the cross that we can be saved. 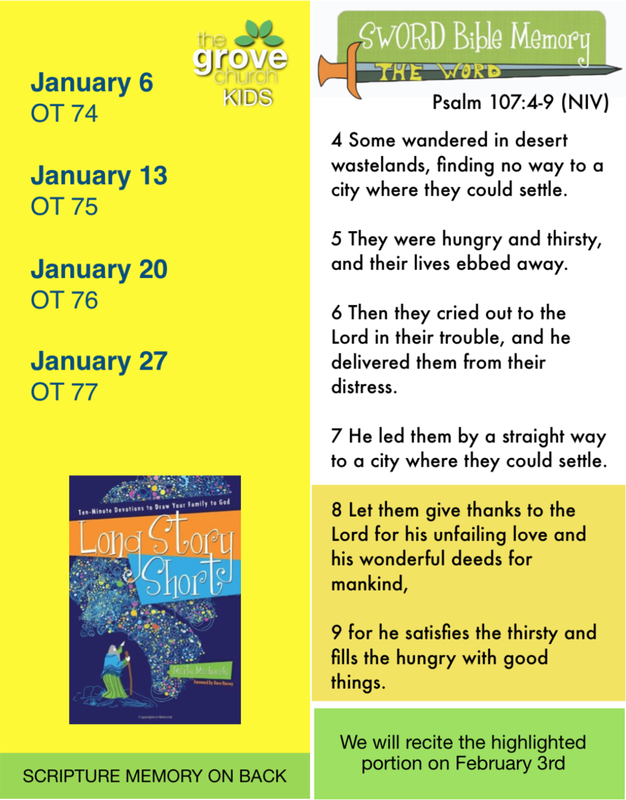 We are on week 74 which starts on page 499 in the Long Story Short devotional. Take a peek below to catch a glimpse of what is in store for family discipleship this week. Pray about it! Ask God to help you trust in the Lord, be humble, and not be slow to believe like Nebuchadnezzar. Check out the highlighted portion on the bookmark below to see what we will recite in our Gathering Sunday, February 3rd.